With the theme “ONE dream. One card for every Filipino's health” the Philippine Health Insurance Corporation (PhilHealth) launched a new identification card that will soon enable members to avail themselves of health and wellness benefits at participating merchants nationwide. A. How does the card look like? The new PhilHealth card measures 76mm, is made up of PVC material and has a magnetic stripe. It comes in full color, both front and back, and displays the member’s name, PhilHealth identification number and date of birth in front. 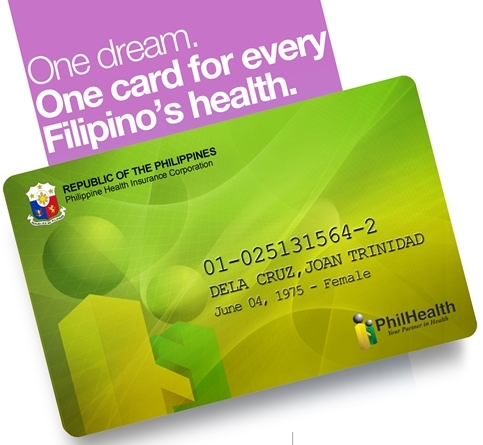 It also has the national coat-of-arms and the full corporate name of PhilHealth on the upper left-hand corner to signify that this card is issued by a government agency. The same design is used for the principal member’s dependents’ ID card, only that the dependents’ ID card comes in a lighter material synonymous to an MRT card. B. Where can this card be availed of? The card is available only in SM and Bayad Center branches nationwide. C. How much does a prospective member need to pay during registration? ** Discounts can only be availed if a PhilHealth member is active or pays premium contribution. D. What must a new registrant bring with him to the registration sites? A new member must bring any valid identification card, copies of supporting documents for qualified dependents he wants to declare, such as original and photocopy of birth certificate and payment for the premium contribution and the card. All original document will be given back to the registrant upon validation and only photocopies will be left behind. E. What will the new registrant bring with him when he leaves the registration site? F. How soon can a new registrant get his card? The ID card will be available at least two (2) weeks from the date of membership registration. G. Does the new registrant have to ‘activate’ the card before he can start availing of the discounts? No. His eligibility to avail of the discounts will be confirmed by the merchant upon online verification of cardholder’s qualifying premium contributions at point-of-sale. H. How often can the cardholder use it to avail of discounts? The cardholder can use the card to avail himself of discounts from participating merchants as long as he is an actively paying member of PhilHealth. I. In what establishments can the card be used? What discounts are available? J. Who are PhilHealth’s other partners in this undertaking? Thus, registration site services would be national within one (1) month. The objective is to encourage enrolment among non-members and the strategy is to partner with the private sector in making registration easier and more convenient. The approach is to couple registration mechanism with incentives to attract more registrants.